Emily Is a Threat To the U.S.
After days of teasing weather watchers (and the National Hurricane Center), a tropical wave in the Atlantic has formed into Tropical Storm Emily. The storm is rather disorganized and not at all “attractive” in the tropical cyclone sense, an artifact of its having had multiple competing vortices for several days that prevented its consolidation into a single system. Because of its delay in getting organized, Emily is a threat to the United States. I am going to blog regularly about this system as long as that remains the case. Emily is going to move mostly west, slightly WNW, along the southern end of the Bermuda High. Its strength will depend primarily on possible land interaction during this time. 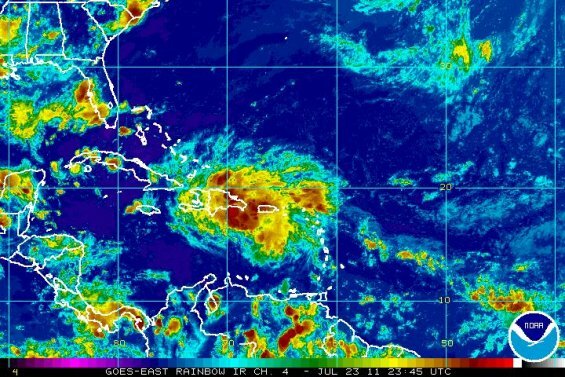 The National Hurricane Center forecasts an impact on the island of Hispaniola, which would weaken the system. How much remains to be seen; many a major hurricane has been reduced to a tropical storm by this island, but some systems that are much weaker have survived passage. It is terribly difficult to forecast how much effect the mountains will have on any particular storm. A lot depends on how well-organized the system is when it reaches the island (I do not mean its intensity; intensity and cyclonic organization are not the same thing), how long it stays there, and whether there are any additional destructive factors such as dry air intrusion and wind shear that are hitting the storm at the same time. It is arguable that there’s not a lot of point in making a forecast for Emily after its interaction with Hispaniola at all, because what happens to it after that will be heavily influenced by its strength at that point. I’ll discuss the various possibilities, however. The high is going to be weakened on its left flank by a trough coming off the Atlantic coast in a couple of days. This should pull the storm to the north. How much depends on how weak Emily is and how strong the trough has managed to become. The stronger Emily is, the more northward it is expected to move, all things being equal with respect to the trough. I think that the trough will be the most important player here, though, and should be watched at least as closely as the tropical system. It is very uncommon to have a strong trough coming off the East Coast at the beginning of August, and there has been a pattern this year of the GFS (the U.S.’s long-range weather forecast model) overdoing the strength of lows in the days before they arrive. I am not inclined to buy into a strong trough unless I see it materialize, but it’s always best not to count anything out, either. Emily is probably too far south and west to have a land-free recurvature (“fish storm”) path. It’s not impossible, but it is unlikely. It simply took too long to develop for that to be the most likely track. Is the Gulf Coast at risk? Short answer: yes, but it’s not set in stone. As of now, I still would say that the Florida peninsula is most likely to get hit, but the Gulf is a definite possibility, especially if Emily is weakened by interaction with land and/or the trough is weak. Several forecasts indicate that the storm will remain weak for long enough to stay south and get into the Gulf of Mexico before making the recurvature. This is not a fluke, or a one-off from some model; it has been a solution for the NOGAPS, Canadian, and UK several times over the past two days. Furthermore, models such as the HWRF have been hinting at a Florida East Coast strike at a perpendicular angle, indicating a strengthening ridge that would force Emily westward again. While these models do not go out far enough yet to indicate what would become of Emily after the Florida strike, entry into the Gulf (in a weakened state) is certainly possible in this scenario. 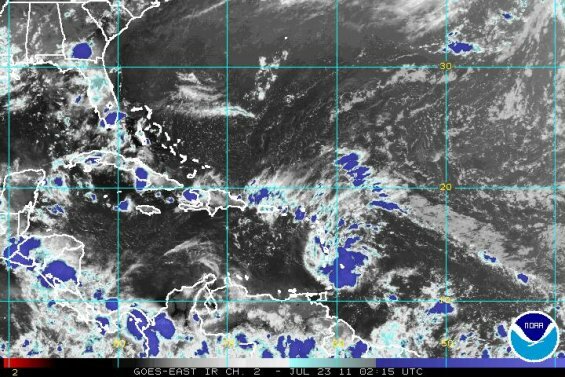 The area of interest in the Atlantic, 90L, has become more likely to enter the Gulf of Mexico. After a time yesterday when it was trying to spin up, the system has stayed weak and is now beginning to encounter land. This land interaction will keep 90L weak as it passes through the Caribbean, making it even more likely to avoid the weakness in the Bermuda High that will be created by a trough. 90L currently has an area of moderate 700 mb to 850 mb vorticity associated with its convection. This area of vorticity is what currently passes for a circulation. It is important to note that, even though the current state of the system is less organized than yesterday and the National Hurricane Center has lowered its percentage of becoming a tropical cyclone in the next 48 hours (which I would completely agree with), 90L has gained additional model support for its long-term development prospects. The cyclone-specific HWRF model was on board with 90L yesterday, taking it just south of Cuba and bringing it to 60 mph by the time it passes by. Today the HWRF keeps the system even farther south, intensifies 90L to a Category 1 hurricane, and sends it into the Yucatan. Additionally, the GFDL cyclone model, which was not doing anything at all with 90L yesterday, is today showing a Category 2 hurricane striking the Yucatan. I think that is overdoing it, personally, but this system is showing indications of going into the Gulf of Mexico and intensifying then. In recent hours, it has become possible that 90L is experiencing a center reformation. The center has been located in the part of the system that is now south of Puerto Rico. However, increased convection just south of Hispaniola (Fig. 1) is changing the polarity of the system, as is evident in upper-level divergence charts (Fig. 2). This convection is likely associated with the mountains and therefore does not indicate improvement in the tropical structure of 90L. However, if the center reforms to the northwest, this will throw a great deal of uncertainty into even the survival of 90L, as it will come much closer to the destructive mountains of Hispaniola and Cuba. If the reformation does not occur, we are looking at a track like that of the GFDL and HWRF. For my part, I am finding it hard to get on board with a center reformation over a more destructive environment that will make it hard for existing centers to stay together, let alone new ones to form, but time will tell. One more important point to note for the GFDL model run is the strong ridge that would, in that scenario, serve to block 90L from moving north after it enters the Gulf. The blocking ridge does not extend that far west in the HWRF run, making a Central Gulf landfall possible. In summary: 90L is in a state of transition at present, and the outcome of a number of possibilities will determine its fate. If the center reforms to the northwest, the GFDL and HWRF tracks should not be considered because they assume the present center. The result of a reformation would be more land interaction, which means a weak system, delays in development, and the possibility of complete dissipation. If the center does not reform, the GFDL and HWRF scenarios are in play, opening the doors for a significantly stronger system (and it should be noted that those models only go out to 126 hours, and have the system as an organized hurricane or near-hurricane in the middle of 90°F waters and low shear). The ultimate landfalling location of 90L will then depend on the strength and extent of the ridge. Figure 1: Rainbow-enhanced infrared image of 90L, Saturday evening. Figure 2: Upper-level divergence over 90L. A tropical wave, designated 90L by the National Hurricane Center, is worthy of being watched by the Gulf Coast states. This system is arguably the first tropical system of real interest to the Gulf states in the U.S., as Tropical Storm Arlene was regarded as a Mexican storm (correctly so) almost from its inception, and Tropical Storms Bret and Cindy were never a threat to any land areas. However, 90L is in a situation that will strongly favor its reaching the Gulf of Mexico, where conditions are favorable for development. The system has been steadily increasing its convection over the course of the day, and with this increase has come an improvement in its cyclonic structure. Cyclonic curvature is evident on satellite (Fig. 1), and upper-level divergence (Fig. 2) indicates good ventilation for the system. Lower-level convergence (not shown) is not so impressive, indicating that the system needs to form a strong low-level circulation to be considered a tropical cyclone. This is usually the last step that developing tropical cyclones take. 90L is in a simple steering regime, being located south of the Bermuda High. In about 3 days, a trough associated with a cyclone is expected to be located off the East Coast of the U.S., eroding the high somewhat. It was previously assumed that this temporary weakening of the ridge would result in 90L being drawn north for a recurvature. 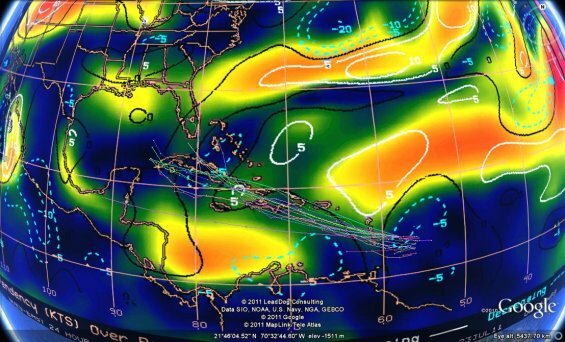 However, recently, it has become likely that the trough will be weaker than previously believed. 90L is also expected to take longer to develop owing to shear and likely land interaction. The net result will be a stronger ridge and a weaker tropical system, and the consensus is that 90L will be forced into the Gulf of Mexico (Fig. 3). 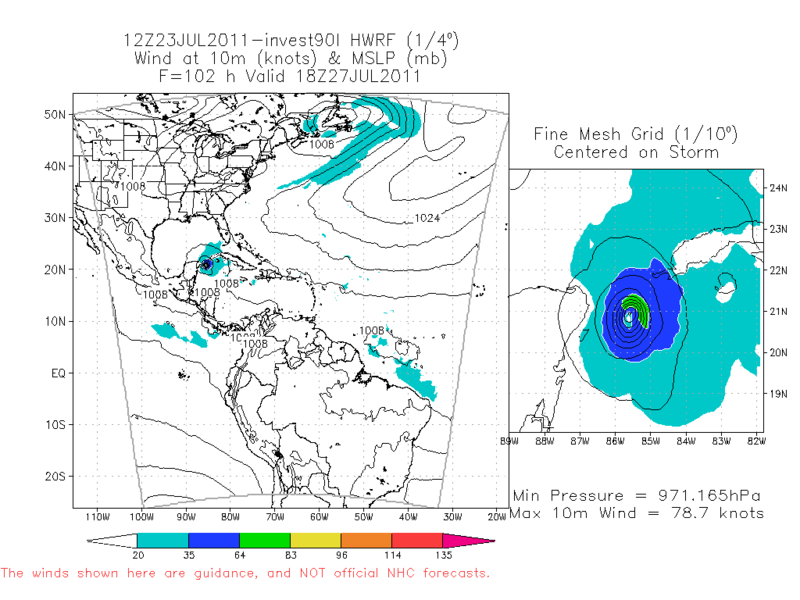 90L will have to pass through an area of 20-knot wind shear (Fig. 3, Fig. 4), which is moderate, but will inhibit strengthening for as long as the system is located under that wind regime. 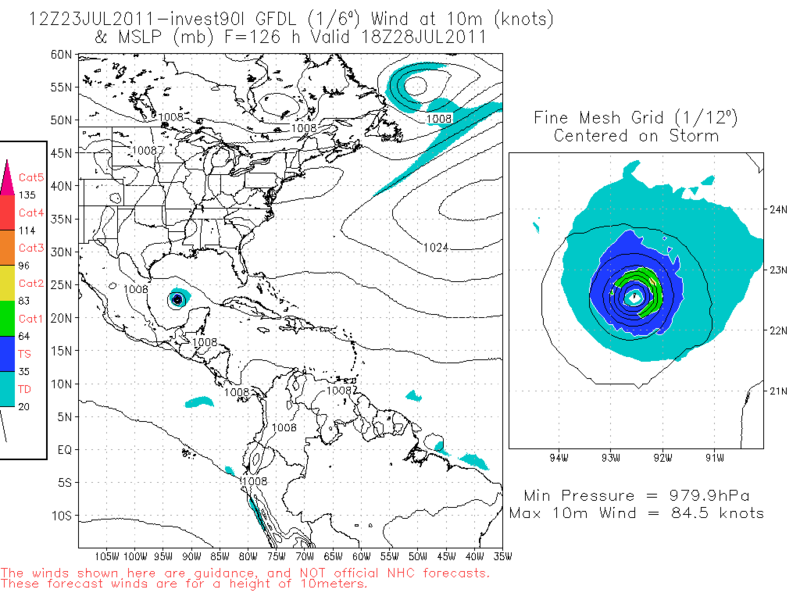 The GFS model does not indicate a sharp spike in wind shear over the course of 90L’s trek toward the Gulf of Mexico. Unless the expected path drastically changes, 90L should enter the Gulf in about four or five days. Models are unreliable for storms like this in the long range, and it should be noted that some of the models, like the GFS, are not particularly impressed with this system in the first place. However, the cyclone-specific model HWRF does develop 90L into a 60 mph tropical storm, keeping it south of Cuba by the end of its run (126 hours out). For my part, I am disinclined to accept a forecast of zero land interaction at this point. However, the salient point is that any interaction with Cuba or Hispaniola will have a profoundly negative effect on 90L’s short-term intensity even if it becomes a tropical storm before reaching those areas, and avoiding those landmasses will result in a stronger cyclone that has not been delayed by a reorganization after being disrupted. My gut forecast for a week or more out (in other words, break out the salt!) is that this system will become a tropical cyclone of moderate intensity (I’ll say Category 1, max, because of mild levels of shear in the Gulf even though the temperatures are well over 90 degrees in many areas) and that it will make landfall somewhere west of Pensacola. I will have updates about this system if it continues to be a concern. Was the Joplin Tornado the Deadliest We Can Expect?